Fund My Mutual Fund: Energy Conversion Devices (ENER) Results and "Darker Times for Solar Power Industry"
Energy Conversion Devices (ENER) Results and "Darker Times for Solar Power Industry"
I have a long (and sordid) past with solar power stocks... since I love high growth sectors I jumped into this theme ahead of the pack in latter 2006. In the interim I've missed a lot of opportunities to the upside and lost a lot of money sticking to stocks that I should not of. This is one sector buying "value" stocks has been incorrect and chasing the top valuation (First Solar) has been the only way to survive any buy and hold strategy. In solar, you can lose money holding stocks for 320 days a year but in 9 day periods every so often you can double your money. In times like this when speculative juices are flowing in the sector, and even the tiniest of companies get run up 100s of percent it is hard to reconcile these performances with long term logic. The market in the near term is anything but logical. We will have some great shakeouts and many of these no name companies rising 400% I expect to be delisted, acquired for pennies on the dollar in half a decade or just be gone. Now as I always repeat in these posts about solar, the counter argument is always, solar is 0.000001% of all energy use and will explode over the coming decades. I don't dispute that. My argument is timing. Timing of supply vs demand. It would only take 4-8 quarters where demand and supply are misaligned (way too much supply vs current demand) and this would crush pricing.... many companies will go from printing money to being major losers. Not only has that been happening but the credit crunch and drop in oil has caused investors to flee. [Feb 6, 2009: NYT - Dark Days for Green Energy] [Dec 20, 2008: BusinessWeek - Clouds Over the Solar Industry] Frankly my largest mistake here was not listening to my theories and going heavily short the group - but again, if you were a few weeks / months early you could easily lose 100% shorting into a mania that was solar circa late 07. That's a smattering of issues; there are more - outside of the black boxes of financials, this is probably the most complicated sector I keep an eye on. But for "investing" (speculation) purposes almost all of that is thrown aside and as goes oil, usually goes solar - with some lag. Now, oil has almost nothing to do with solar energy - but in the simplistic mind set of the "market" they seem to have a 1:1 relationship (solar is a competitor with coal and natural gas). Granted HAL9000 of quant fund, program trading fame trades the entire complex (coal, nat gas, oil) as "one" 90% of the time so I guess through osmosis oil = natural gas; at least for stock jocks and their computers. Remember, the stock market likes simple, dramatic easy explained thesis / themes - granularity is not its strength. It really comes down to a marriage of government incentive introductions / expansions, overlaid with improved technology to drive down break even price points, overlaid with a very dramatic increase in commoditization as barriers to entry are low, overlaid with first mover and / or advantages of size / scale. In this piece I thought I'd focus on the earnings results from Energy Conversion Devices (ENER) which is a unique niche player in the space - but their commentary speaks to the "moving parts" along with a well timed Wall Street Journal piece further down the page. As I read this, it makes the continued outperformance of First Solar (FSLR) all the more remarkable. 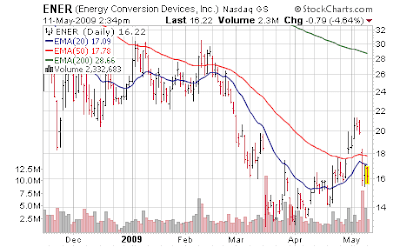 Energy Conversion Devices Inc (ENER) on Monday reported a 81 percent drop in third-quarter profit due to weak demand for solar power in the United States, and the solar company declined to provide outlook for the fourth quarter, citing poor visibility. Net income for the fiscal third quarter ended March 31, 2009 was $1.3 million, or 3 cents per share, compared with $7 million, or 17 cents per share, a year ago. Revenue came in at $66 million, compared to $70 million in the third quarter of fiscal 2008. Gross margins on solar product sales for the latest third quarter was 29.2 percent, down slightly from 30.7 percent a year ago. Skyrocketing demand for solar power was a bright spot in the global economy last year until a pullback in solar subsidies in Spain and frozen credit markets dried up access to project financing and choked off demand. "The global market continues to be difficult, with the biggest challenge being the sufficiency of project financing and our customers' continued access to capital," Chief Executive Mark Morelli said in a statement. Raymond James analyst Pavel Molchanov said the fact that the company did not offer any guidance suggested visibility remained bad. "Their news last week further adds to the perception that demand is very, very poor," he said, adding that revenue estimates for the June quarter and for fiscal 2010 will need to come down 'quite considerably'. Raymond James' Molchanov said lower selling, general and administrative (SG&A) expenses helped results. (chop chop chop heads... make the number) For the latest third quarter, the company reported SG&A of $12.3 million. For the second quarter ended December 31, 2009, operating, general and administrative expenses came in at $17.2 million. "The reality is that average selling prices are coming down across the board in the industry. So it would be very unlikely for any of these companies or practically anybody in the solar space to see a lot of margin improvement," the analyst said. While ECD declined to disclose its average selling prices, the company said prices came down by low single-digits in the quarter.... it anticipates further declines in ASPs going forward. The global recession and tight credit conditions have cast a chill on the solar-power industry after years of breakneck growth, and could usher in long-term changes in the industry. Banks have curtailed financing for major solar projects, and Spain -- the world's second-largest solar-power market after Germany -- has slashed subsidies for the industry, leading to sharply lower demand for solar cells. Sales of the tiny chips that convert the sun's rays into electricity are expected to drop by at least 20% this year. Now the great hope is America (Obama) and China (government) will offset any weakness in Japan or Europe. The chart to the right shows you how wide the gulf is between those early adopters and the "Big 2" that future hopes are resting on. But domestically, I just don't see the demand in the consumer space anytime soon with people struggling to stay in homes as first priority (I am excluding the upper 5% of course who would be more able to pay the costs) - so I assume the American push will be driven more by the corporation if and when. As for China, who knows - we see juicy leaks of massive subsidization programs and with the heavy pollution it would behoove them to stoke their in country industry. But that's been a thesis for multiple years now. In environmental terms, there may be a silver lining in the industry's woes. The drop in prices for solar-power gear could make solar energy more competitive with burning fossil fuels to generate electricity, even if oil prices stay at around $50 a barrel. (again, even this writer compares solar to OIL - instead of nat gas or coal) Today, less than 1% of the world's electricity comes from solar power. "The dramatic cost reductions now happening in solar will be good for the industry and the environment in the long term," said Sven M. Hansen, chief investment officer of Good Energies LLC, which invests in renewable energy. "But in the short term, the outlook for solar companies has never looked more difficult." Now here was the long term issue I really was worried about - solar bulls always come back with "we'll make it up with volume" aka the same thesis I heard with unprofitable internet stocks in the late 90s. Again, it doesn't matter (for stock purposes) what the reality is in the long run - many of those internet stocks created massive wealth as long as you got out at the right time and there is no reason speculative fever can't push solar stocks up 100, 200, 300% at any period of time. But the commoditization issue is a real long term danger, at least from this perch. Some industry watchers think the current downturn is more than a bump in the road. Dan Reis, analyst at investment-research firm Collins Stewart, says falling solar-cell prices could herald an era of lower profits and thinner margins. Sales of solar panels will boom in volume terms, Mr. Reis said, but since prices will be much lower, companies with low costs, such as Chinese manufacturers Trina Solar Ltd. and Yingli Green Energy, will have an advantage. Even so, solar-cell makers may get some relief as countries including the U.S., Japan and China provide more support for renewable energy either as part of their economic-stimulus plans or to combat global warming. But those subsidies are unlikely to translate into an uptick in solar-cell orders until next year at the earliest.